Carolyn Marie is the champion to the ‘last hope’ people; a coach to the nutritionally challenged and a crusader with an easy common-sense approach to healthy living. As an author, web TV host and nutritional speaker, Carolyn Marie Solton is leading America in the fight against life threatening illnesses and toxic living through smart holistic nutrition and healthy living. Carolyn created her own miraculous healing from several serious life threatening situations. Working naturally to avoid drugs or further surgery, Carolyn Marie’s achievements kindled a ferocious desire to learn more in the field of holistic health and natural healing. In nature. I love being nurtured by nature. Whether it’s at the beach, mountains or in my own garden there’s a connection the outdoors provides that soothes my mind, body and spirit. Beauty is found everywhere (such as in music, in dance, in laughter, looking into a lovers eyes). Most obviously beauty is found in nature. Beauty stems from the inside out. When we feed ourselves not just physically but spiritually it reflects on the outside. Feeling healthy is my top answer. When I feel healthy I feel beautiful and have the most to offer the world. What do you do when you want to pamper yourself? Massage is a favorite way I enjoy being pampered. I love the fact that, besides feeling good, massage helps with tension and scar tissue. I regularly take aromatherapy salt baths as well. I have a myriad of essential oils (many of which I brought back from Egypt). Rose is a favorite oil I use, yet each oil moves me in a unique way. It’s a very alchemical bathing experience. What I put into my body is important to me. I want only the highest vibration food going into my system. What I put on my skin I put into my body. The fact that AnnMarie’s skin care line is all natural, wild crafted and organic allows me to relax. With AnnMarie’s line I know I’m nutrifying myself both inside and out. Isn't she beautiful? 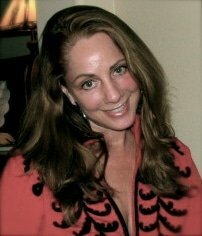 If you want to keep up with Carolyn Marie's amazing life, follow her at healingnrg.com! You may also view and purchase her ebook titled ‘DYING TO BE WELL, My Journey With Western Medicine a Hard Pill to Swallow' here.